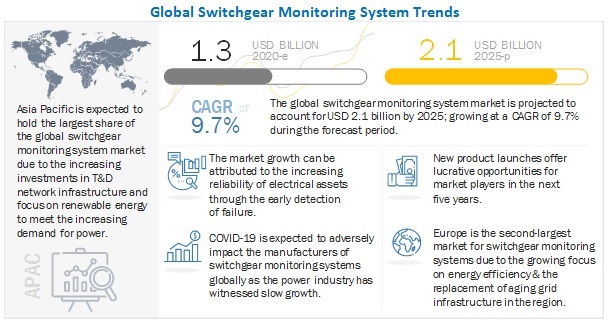 [140 Pages Report] The global switchgear monitoring system market is projected to reach a size of USD 2.0 billion by 2023, at a CAGR of 7.83%, from an estimated USD 1.4 billion in 2018. Growing investments in renewable energy and demand for safe and secure electrical distribution systems have increased the demand for switchgear monitoring system. By switchgear type, the gas insulated segment (GIS) accounts for the largest contribution in the switchgear monitoring system market during the forecast period. The report segments the switchgear monitoring system market, by switchgear type, into GIS and AIS. The GIS type is expected to hold the largest market share by 2023. They are mainly used in industrial areas to fulfill high-energy demands through a space-saving design of minimum cost. GIS are deployed in various industries, serving different needs at varying voltage levels. This would drive the demand for GIS monitoring systems. The hardware segment is expected to be the largest contributor during the forecast period. The switchgear monitoring system market, by component, is segmented into hardware and software & services. The hardware segment is expected to dominate the market by 2023. Hardware devices help control, measure, transmit, and analyze the data in the process and non-process industries, utilities, commercial, and other sectors. As these devices can be controlled or automated from the control room by the control system/software, they are essential in monitoring operations. Utilities segment is responsible for the generation, transmission, and distribution of electricity. Electric utilities include investor-owned and publicly-owned cooperatives and nationalized entities, which are the major providers of electricity in most of the countries, worldwide. On the other hand, increasing laws supporting reliable, uninterrupted power supply is increasingly being adopted in regions such as North America and Europe which is driving the market for switchgear monitoring system. North America, Europe, South America, Asia Pacific, and Middle East & Africa are the major regions considered for the study of the market. Asia Pacific is estimated to be the largest market from 2018 to 2023. Countries such as China and India are undertaking a lot of smart grid and substation projects to fulfil the growing demand for energy. This would drive the switchgear monitoring system market in the region. The major players in the global switchgear monitoring system market are Schneider Electric (France), Siemens AG (Germany), ABB (Switzerland), General Electric (US), Emerson (US), Eaton Corporation (Republic of Ireland), Koncar Electrical Engineering Institute (Croatia), Mitsubishi (Japan), Tiara Vibrasindo Pratama (Indonesia), Trafag (Switzerland), Senseor (France), Fortive (US), and Independent Power Engineering Consultants (UK). In December 2018, IntelliSAW launched a new family of sensors designed for LV asset monitoring, leveraging its Integrated Near-Field Coupling (iNFC™) technology. In December 2018, ABB won a contract from Fingrid to upgrade one of Helsinki’s substations, to meet the increased demand for power, improve power reliability, and assist transmission system operators in the country. The scope of the contract includes an outdoor air insulated switchgear (AIS) installation with its gas insulated switchgear (GIS) technology. In addition to the supply, ABB will also install modular switchgear monitoring (MSM) devices onto the GIS to enable online condition monitoring of the circuit breakers. In April 2017, ABB launched a new series for molded circuit breakers, the new SACE Tmax XT that offers metering and connectivity features, high performance, protection at up to 1,600 A. In May 2017, Schneider Electric won a contract from Neoen (France) to deliver 1,500 V central inverters, transformer, monitoring, and medium voltage switchgear solutions to solar projects. The report identifies and addresses key markets for switchgear monitoring system, which would help manufacturers review the growth in demand. The report addresses the market share analysis of key players in market, and with the help of this, companies can enhance their revenues in the respective markets. The report provides insights about emerging geographies for switchgear monitoring system, and hence, the entire market ecosystem can gain competitive advantage. This study involved 4 major activities in estimating the current market size for the switchgear monitoring system. Exhaustive secondary research was done to collect information on the market, peer market, and parent market. The next step was to validate these findings, assumptions, and market sizing with industry experts across the value chain through primary research. Both top-down and bottom-up approaches were used to estimate the total market size. Thereafter, the market breakdown and data triangulation were done to estimate the market size of the segments and subsegments. This research study involved the use of extensive secondary sources, directories, and databases, such as Hoover’s, Bloomberg BusinessWeek, Factiva, and OneSource, to identify and collect information useful for a technical, market-oriented, and commercial study of the global switchgear monitoring system market. The other secondary sources included annual reports, press releases & investor presentations of companies, white papers, certified publications, articles by recognized authors, manufacturer associations, trade directories, and databases. The switchgear monitoring system market comprises several stakeholders such as end-product manufacturers and end-users in the supply chain. The demand side of this market is characterized by its end-users such as utilities, industries, commercial, and others. The supply side is characterized by monitoring technologies such as temperature monitoring, partial discharge monitoring, hardware, software & services, and others. Various primary sources from both the supply and demand sides of the market were interviewed to obtain qualitative and quantitative information. After arriving at the overall market size-using the market size estimation processes as explained above—the market was split into several segments and subsegments. To complete the overall market engineering process and arrive at the exact statistics of each market segment and subsegment, data triangulation and market breakdown procedures were employed, wherever applicable. The data was triangulated by studying various factors and trends from both demand and supply sides, in the utilities, industries, commercial, and other sectors. Asia Pacific, North America, Europe, Middle East & Africa, and South America. This research report categorizes the switchgear monitoring system market based on switchgear type, component, end-user, voltage, monitoring type, and region.